in case you need some evidence, i have some for you!! it says “MICROWAVE REHEATABLE” on it, which, um, clearly, is a big fat lie. Rubbermaid, sadly, did not send over lunch for me. they did send this…their sense of humor.. 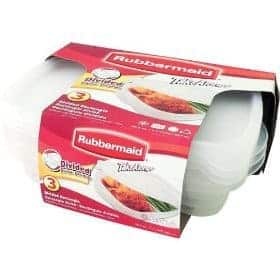 So, Rubbermaid gets some points for making me giggle a bit, but they get a NEGATIVE review from me for leaving me hungry at lunch time. We use glass Lock-n-Locks that we got at Costco, or smaller Corningware stuff with lids from their outlet stores. 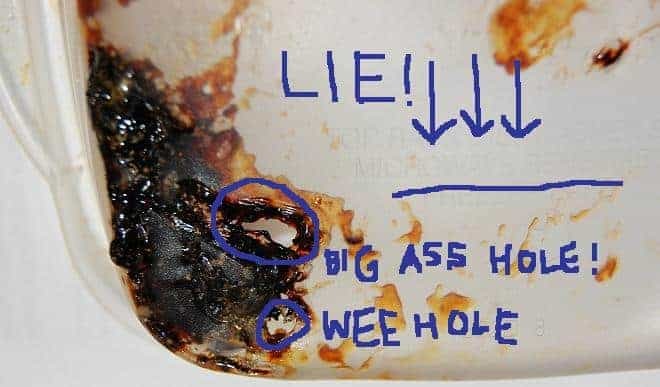 I never microwave plastics simply because the heat can promote leeching. For a second there, I was worried this was going to be some Biggest Loser-esque product placement. I store my stuff in plastic but I keep a place setting in my desk and transfer it all to that for heating/eating. I just go so tired of trying to scrape burnt food off of plastic. Oh and the whole don’t heat plastic thing got to me. I had some of those and they never did that to me… I use mostly glassware now though. I remember reading your tweets, but missed their reply. Awesome. Also love your photoshopped words. Heh. Hopefully this is the very bad thing that has happened while your huz is away! I will have to stop because I always microwave in those things but that is scary! Kathys last blog post..My daughter WANTS to sleep on the floor, really! Huh, I use those same containers and they’ve never burned up in the microwave. Perhaps Rubbermaid has something against you? I’m sorry, but Rubbermaid totally just gained a TON of points in my book. I mean, they couldn’t send you a real lunch (they could have sent you a replacement container or coupon, though) but that was funny and they responded! 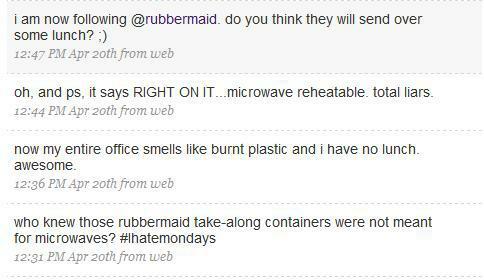 As a marketing person, that is an EXCELLENT use of social media on Rubbermaid’s part. I’m guessing your microwave is like mine at work and is super-powered. Dude, the stink of plastic is almost as nauseating as that of reheated seafood. Blech. I HAD those rediculous containers and the lids fall off!! How bad is it that I had to TAPE them on. (fancy in the lunch room) Let’s not mention the leaking… sick.. I am bringing back the tupperware! Stick with the classics! The only thing better than this review is the child like writing on the pictures. bwahhaha.